KITCHENOPEDIA will help you to find the BEST PASTA MAKER MACHINE for yourself so you can make and cook the best pasta for your family. And our aim of this article is to help u lead towards the best pasta maker machine and help you to purchase a very cost effective pasta maker for your kitchen. And if you are looking for an ultimate pasta maker machine then, Marcato Atlas Wellness 150 Pasta Maker is the key to the perfect pasta making at home. It is highly efficient and cost-effective pasta maker machine with a great aesthetic appearance and can generate perfect thickness of pasta sheets as per the requirement. Thus, you will find here the world’s best pasta makers and their reviews in-depth by our experts and the pasta lovers. The top list of pasta maker bellow will help you to purchase better pasta maker for yourself. This list consists of the top of the chart pasta makers, both electric as well as manual pasta makers. With the specificational knowledge of these products, you will tend to choose the unit wisely when you are buying the perfect pasta maker that suits you. The Marcato Atlas Wellness 150 is a conventional and classic, manual pasta machine. This Pasta maker machine provides us with various options as it is available in various colors. So you have various options to choose from and select the color which suits your kitchen appliances and interior. This pasta maker is about 3 pounds in weight but the good part is that it can be easily adjusted and is able to fit even in a standard kitchen cabinet. The machine is actually shorter in height. These pasta machines come in various colors such as green, pink, red, black, blue, gold, silver, light blue and copper. With the help of this colors of the pasta machine, you can accommodate a huge range of kitchen color schemes. In the process of making pasta, you must turn the hand crank of a past machine manually which is located on the right-hand side of a pasta machine. This manually powered pasta machine is not much of the use to those people who have minimal strength due to any reason. For the people who are capable of withstanding the resistance, the manually operated crank of pasta machine allows you to speed up the dough as it is shaped. So you can redo any issues during producing the pasta from a pasta machine. Marcato Atlas Wellness 150 pasta maker machine is limited. This pasta machine allows you to make only three different shaped pasta. It produces the lasagna and fettuccine noodles which come out in sections of 6 mm wide, and the taglioni is produced in 1.5 mm sections. Apparently, this pasta maker machine is designed to make flat noodles of varying widths and it does not even make your spaghetti. If you need to make pasta in other shapes, the manufacturer of pasta machines has created 12 compatible accessories. Actually, these accessories, unfortunately, are not compiled within the kit. So if you need to make different shaped pasta you would require various accessories along with the pasta maker machine. The manufacturer of this pasta machine even provided a bayonet fitting through this pasta maker machine is manually powered. The bayonet fitting is constructed on the opposite face of the hand crank of the pasta machine. This pasta machine is manufactured in Italy and comes with a 10-year warranty. This pasta machine is to be washed either with a small brush or a toothpick and not to be washed in the dishwasher. The Marcato Atlas Wellness 150 Pasta Maker comes in a limited or says minimum amount of shapes but it coordinates well with many kitchen colors. And if you are a true pasta lover and love to make different shaped pasta using pasta maker recipes then you may need to purchase accessories for more variety. 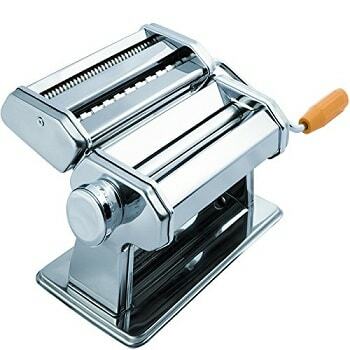 Body: The body of this pasta maker machine is of chrome plated stainless steel and it is very sturdy. Feature: The machine is very easy in use and provides a wide variety of adjustments. Cleaning: It is quick to clean this pasta maker machine. Usage: It is very difficult to use this machine without another person. Handle: The detachable handle of the machine sometimes falls out while working. The CucinaPro Imperia Pasta Machine lets you convert pasta dough into sheets of pasta. 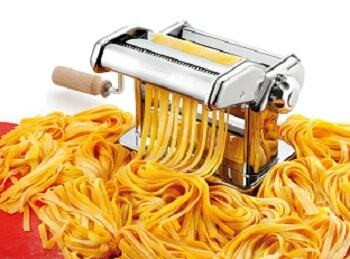 This pasta machine can make spaghetti and fettuccine with a great excellence. The other types of pasta may require attachments which you would need to buy as they are not the part of the pasta maker kit. This Imperial pasta maker machine is manufactured as a solid metal piece which is highly sturdy and durable product. The machine looks more attractive as it has a chrome-plated finish of steel, which gives off a shine. The attachments that can be attached to the pasta machine but are needed to be bought from the market included are the double cutter for making a perfect spaghetti or fettuccine. The table clamp is also an attachment used to secure and hold the pasta machine to your kitchen counter. Both of these attachments are also chrome-plated steel to increase the aesthetic value of the product. Whereas the handle of the pasta maker machine is made of wood, is the only part of the product that is not metal. The double cutter accessory for the pasta machine has two size settings for different kinds of pasta: 1/16 inch for making spaghetti and 1/4 inch for making fettuccine. These attachment allow you to select the width of the pasta that is to be produced. And if you are willing to cut your own pasta then you can remove the cutter from the pasta machine. Even if you want a sheet of lasagna pasta, then also you are able to remove the cutter. The rollers of the pasta machines help in pushing and flattening the dough as it passes through the Imperia pasta maker gets 6 inches wide. This pasta machine cannot produce a sheet of pasta wider than this. By rolling the pasta dough through this pasta maker machine does not require much force. 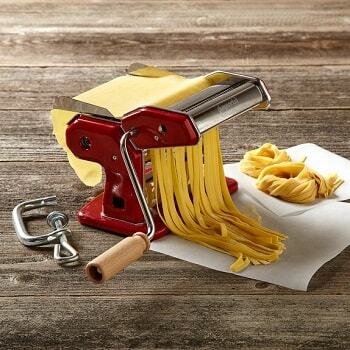 The Imperia pasta maker machine provides you the wooden handle for turning the crank. This wooden handle makes it comfortable and possible for you to turn the crank through the handle easily and smoothly. There is the facility in this pasta machine known as adjustment dial mechanism that affects the thickness of the pasta sheet. The Imperia Pasta Machine has a lot of many attachments which are not combined with the purchase of the product. These add-ons let you make various pasta shapes above just spaghetti or fettuccine. Another accessory that can replace the wooden handle is an electric motor. This allows you to eliminate the need for clamping any pasta machine to the counter. When the device clamps are used, you require the edge of a countertop or a table to secure the machine. The electric motor allows you to move the appliance anywhere because you do not need to clamp it. These additions can cost as much as the pasta maker itself. Additionally, a recipe book is also included with this pasta machine. This booklet helps those who are new to making pasta at home or want to learn different pasta styles. A caution note by the manufacturer is that the Imperia Pasta Maker machine should only be cleaned with the help of a dry cloth and a soft-haired brush. All of the attachments that you may use requires cleaning after use. The CucinaPro Imperia Pasta Maker is an Italian-made pasta maker. It is highly capable of creating sheets of pasta, spaghetti, and fettuccine. However, it only makes a couple types of pasta without the attachments, and you must secure it to the edge of the counter if you do not have the attachments. Body: The body of this pasta maker machine is strong and durable. Stability: The machine is stable and compact. Feature: It is quite versatile and highly efficient. Attachments: The additional attachments are needed to buy seperately. Instruction: The instructions in English in the manual are not very clear. The Philips Avance Collection Pasta Maker is a complete electric pasta machine which mixes all your pasta dough and then pushes the dough through the mechanism to make a lot of different shapes of pasta. It instantly produces a large mass of pasta. This would be beneficial for you in a way that you can quickly complete the work and get on to the other. The electric mechanism of the pasta extruder machine gives your pasta consistency in texture and taste both throughout the process. The texture and the taste are not dependent on your pace or mixing capabilities. The pasta extruder machine is powered by a 200-watt motor. This motor gives pasta extruder the power to generate 1600 pounds of extrusion force. This high level of force moves the mixture of pasta dough from the rollers quickly and needs no physical work from you. What you have to do is just press a switch to provide you a raw pasta about a pound within few minutes. This speed is profitable for those who are in commercial settings greatly since it requires some more time to create the sauces and other ingredients of pasta recipes along with the pasta. This pasta maker allows attachments to produce spaghetti, penne, lasagna and fettuccine by using various shaping discs. But to make various shapes pasta would require different attachments to be bought which results in the total cost of the machine. A recipe book is equipped with the pasta machine which provides different homemade pasta recipes. It also guides you to make the various topping and sauce combinations to enhance your cooking skills. This is a good start for a beginner because a lot of work is done automatically. The maintenance of this pasta extruder is high as it needs in-depth cleaning than other kitchen appliances.This pasta extruder includes a specialized brush to clean hard-to-reach areas. The unit even includes separate measuring cups for water and flour to help you make perfect pasta. This pasta machine weighs 17.2 pounds, secretly this homemade pasta machine consists of a hidden drawer beneath the unit. The drawer lets you store your accessories so you don’t group them in with your other kitchenware and end up misplacing them. Work Efficient: The process of making pasta requires very less work. Feature: This pasta machine is an electrical pasta extruder. Body: It has a drawer in the bottom part of the unit. Maintenance: It requires large amount of maintenance. Electric Power: This pasta maker being an electric pasta extruder requires electric power to operate. 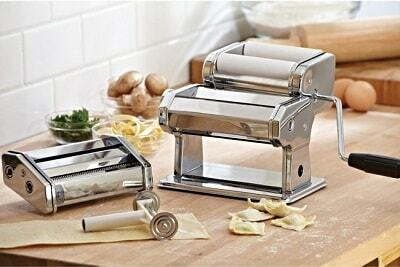 The KitchenAid Pasta Roller is a pasta maker attachment. It is actually the attachment for the electric KitchenAid Stand Mixer. It can be attached to any of the KitchenAid Stand Mixer’s power hubs to create sheets of fresh pasta dough. It can be used to make long sheets of pasta and then cut the pasta by hand. Later fold it into your desired shapes. This pasta roller converts your universal stand mixer into a pasta machine. It is to be attached to the power hub, which is present in all the KitchenAid stand mixers. Here you have the capability of mixing the dough in the mixer and then later attach the roller. Now roll it out by running the stand mixer machine, instead of rolling it by hand. This attachment roller allows you to produce sheets of pasta up to 6 inches wide. The sheet made has a uniform thickness all over it. The KitchenAid Roller is provided with a thickness selector switch with eight different settings. You provision to use various thickness options to set that thickness which allows you to roll long. It can also work for thick sheets of pasta for lasagna or to hand cut them into squares for ravioli or strips of fettuccine. If you set the roller on the medium setting, it allows you to roll thin sheets for spaghetti. It even helps for making sheets of dough which later can be cut in squares and then fold them into any shape you want. When the thinnest setting is done, very fine angel hair or capellini pasta can be made out of it. Usage: This pasta maker is easy to use. Feature: The machine is efficiently designed and is of high quality. 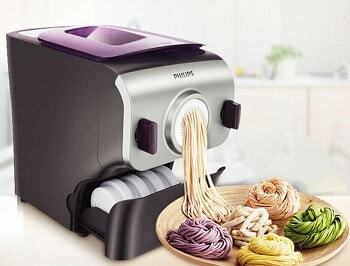 Power: It is very powerful machine and can make various kind of pasta. Clean: It is bit difficult to clean this machine. The Williams-Sonoma Imperia pasta machine is a hand-operated pasta maker. This pasta maker provides us two color options for the unit. The pasta machine is compact in size and very useful as well. 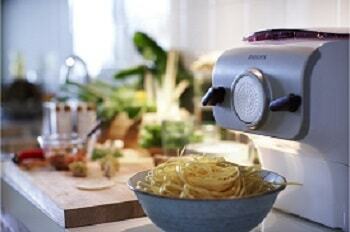 Thus the pasta machine fits well and easily on your counter-top occupying very small space. It can even be placed inside your cabinets. 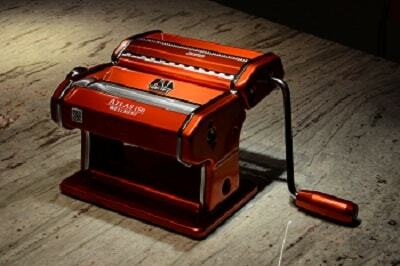 The colored areas of the machine provide a great look to the pasta maker making it more lively. These colored areas are made up of coated enamel for the hue. Whereas the rollers of this pasta machine are made up of chromed steel material. These chromed steel rollers are nickel-plated to minimize the amount sticking of pasta dough on it. The pasta machine is equipped with a wooden handle. With the help of this wooden handle, the turning of rollers takes place manually. This wood handle is designed with a comfortable grip for extended purposes. At the bottom of the pasta machine, rubber grips are provided. These rubber grips hold the machine at the particular place without any trouble. Thus it provides you a strong stance on the use of the pasta maker machine. Moreover, to further strengthen the grip, the pasta machine kit even includes a detachable C-clamp to secure the pasta machine on your counter-top. No matter what type of pasta you are making from the pasta maker machine but the machine is always operated with the help of turning a handle. The turning of handle requires steady and slow rotation for the dough to flow through the rollers and other parts. A manual homemade pasta maker machine does not prove beneficial for those who have a problem with their joints and other physical difficulties. As the turning of the handle of the pasta machine requires a bit of muscle power to be operated. If you have the ability to manage the speed simultaneously, though, this allows taking control of the pace so you don’t fall behind. And as the newly formed noodles pile up if you do not work according to the pace required. Your dough rests in the detachable tray as it is drawn pass through the rollers straight onto the countertop, cutting board or bowl that you have placed below the pasta maker machine. 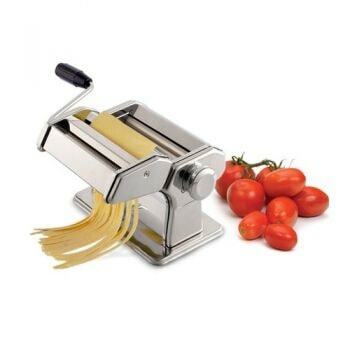 Body: The body of this pasta maker machine is very durable and compact in size. Weight: The machine is light in weight but highly accurate. Usage: It is quick and easy to use. Celaning: It is bit difficult to clean this pasta maker machine. Clamping: It is difficult to clamp down the machine. The Eurodib Pasta Party Machine can make spaghetti, tagliatelle, and similarly shaped pasta. This appliance is a manual pasta maker from France that includes a manual, a recipe book and a warranty on all parts for three months. This stainless steel machine is nearly one solid piece. The black, plastic handle is the only nonmetal piece. The removable parts are the accessories that cut the dough as it rolls through the appliance. The unit is 8 inches long, 8 inches wide and 5.5 inches high. The roller of the Eurodib pasta maker consists of an adjustment knob on the side face of the pasta maker with nine various settings. These settings allow us to regulate the thickness of the pasta while the apparatus churns it out. The minimum possible thickness with this pasta maker machine is 0.3 millimeters, whereas the thickest pasta sheet you can roll is 2.5 millimeters. This will allow cutting different sizes and thicknesses of pasta sheets. Thinner settings made are used for making spaghetti or even for tagliatelle pasta, and the thicker sheets are ideally used for lasagna. This pasta maker machine weighs a little less than 7 pounds. Thus the pasta machine is a compact machine and very effective in terms of space. It can be clamped to the edge of the counter-top or the table. This clamping of the pasta maker on the table or countertop allows it to remain sturdy and fixed even when you turn the handle and roll the dough into pasta sheets. This can be a drawback as well as where to place the pasta maker machine in your kitchen and even can be an issue if you have limited counter space. This pasta maker does not possess many separate attachments for the pasta production. The Eurodib pasta machine does not sell any kind of add-on parts which let you produce shapes other than spaghetti and tagliatelle. It does not even motorize the appliance. The pasta maker machine includes a recipe booklet with it. The purpose of this book is to teach beginners to make various kinds of pasta by sharing step-by-step instructions towards a great food. There are various recipes for different pasta dishes which you can learn and make one for yourself every now and then. The book also teaches you the method of how to make a dough from scratch and other important information regarding the pasta making. The Eurodib pasta maker machine is manufactured for the beginners who want to learn about pasta making. However, it is limited up to two cuts of noodles as the Eurodib pasta maker does not manufacture attachments for this pasta maker. Rollers: The rollers of the machine are adjustable. Addons: It includes a recipe book as well as attachments. Operation: It is a manually operated machine which means pasta are to be made manually. The Ronco Electric Pasta Maker is an electric pasta maker machine that shapes, mixes and kneads the pasta dough for you. This Italian style pasta maker machine can even be used to make fettuccine, rigatoni, lasagna, linguine, spaghetti or Asian noodles fresh at home. This pasta machine can help in limiting the food additives and even helps you in controlling the preservatives in your diet. This pasta maker is a heavy-duty plastic body. The pasta shaper of this machine is made up of metal. The Metro Italian pasta maker is transparent apparatus. This helps you to see the process when the pasta is finished kneading. The machine even consists of a recipe book for you to learn various pasta making processes. It even consists of a measuring cup, five pasta dies, and an instruction manual, everything to make your pasta making experience simpler. The pasta machine plugs into any standard electrical outlet. This pasta maker machine makes pasta at a great speed and simplicity within five minutes. The pasta machine kneads and mixes the dough in approximately three minutes time, and then pushes the dough out through a shaping die which will generate pasta of different shapes. The pasta machine consists of five pasta die that you can change to make the desired shapes of pasta. It produces thick or thin flat noodles, thin or thick round noodles, and even tube-shaped noodles with the help of various shaped dies. It makes pasta of various kinds that are uniform in shape and thickness, that means it is of higher accuracy in pasta making. You just cut the noodles as they are pushed out of the die in order to make noodles as long or as short as you want. While the machine does most of the work, the controls require you to manually switch them from mixing to extruding, so you do get some control over the dough-making process. What you need to do is just cut off the noodles as they are drawn out of the die. With this process cut the noodles as long or as short as you required, according to the purpose. The pasta machine can even be disassembled for cleaning purpose. The benefit of this apparatus is that the parts of the pasta maker machine and all other accessories are safe to clean in the dishwasher. You can wipe down the pasta machine with a damp cloth. This pasta maker comes with a safety switch. This safety switch allows the mixer of pasta maker to turn on only when the lid is properly locked in its place. Body: This pasta maker has a metal body. Cleaning and Usage: It is easy to clean and use. Sturdy: The unit is very sturdy and hence a solid unit. Instructions: The instructions provided with the unit is poor. What is a pasta maker? 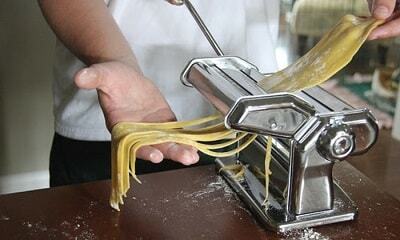 A pasta maker is a tool that assists in the kitchen, designed to facilitate the making of pasta. It can even be described as the pasta machine or pasta maker machine. These pasta makers aid the people to make various kinds of pasta at home by their own. It becomes very easy and uncomplicated to make various pasta such as linguine, fettuccine, spaghetti and much more. These pasta maker machines can be found everywhere in the household use as well as in professional and industrial applications. The basic pasta making machine is equipped with a bolting facility to bolt it on the countertop. It even possesses various fittings such as pasta rollers, pasta cutters, handles and so on. The basic pasta machine mainly consists of a pasta roller which rolls the dough that is placed in it. And a pasta cutter that cuts the rolled sheet from the dough. Whereas a crank or the handle is included in the pasta machines for turning the rollers or the cutting blades. Various pasta maker machine includes attachments to make stuff pasta which facilitates the pasta machine recipes. With the help of an automatic pasta machine or manual pasta machine, we can make different pasta very easily. To make the pasta, the pasta dough is prepared by the cook if he is using the manual pasta maker machine. The dough is then broken into chunks and is passed through the rollers of the pasta maker. You can adjust the distance between the rollers as per your requirement for the thickness of pasta sheet. From here the long sheet of dough is then sent through the cutters of the pasta maker. Here the sheet of pasta is being cut and transformed to the desired shape and size. These pasta strips can be immediately cooked or can even be refrigerated for several days. The pasta maker has several other ways in which it can be used. 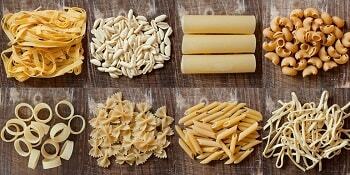 The pasta strips can be cut into small shapes and sizes to make handmade pasta. Even the pasta strips can be left completely whole to make lasagna or something. Some people curl the strips to make different shell-shaped pasta and some even pinch the strips to make farfalle from it. The pasta maker machine provides the facility to attach various attachments to produce the desired type of pasta. It cabeven bee equipped with a ravioli making attachment to make the ravioli with a pasta maker. With the help of related machines known as pasta extruder machine, making pasta of different shapes becomes possible. By using the dies that can be fitted at one of the ends of the hollow cylinder, the dough made for pasta is forced through the cylinder. This forced dough then gets mold in various shapes due to the die. Many manufacturers are manufacturing pasta extruder machine and different dies for them, for the cooks who love experimenting with different types of pasta. The classic conventional design of pasta makers is indeed quite old in terms of technology. Yet they are being used in most of the houses and restaurants. These conventional pasta makers need a great deal of work compared to the latest electric pasta extruder but obviously the classics have their own charm. These classic manually operated pasta makers required to be operated manually as the name suggests. And if you wanted any different shaped pasta then you require different pasta attachments that are to be attached to the machine. But apparently, they had no significant changes in their design over the ages, until now. The conventional manually operated pasta maker machines have for basic parts that are important: (1) the rollers, (2) the cutters, (3) the manual handle and (4) the regulating knob. These elements are the most basic and essential components of the manual pasta maker machine without which the pasta maker is not a pasta maker. The working o these components are interrelated and work in as the group of mechanisms which as a result produce the pasta. The handle, when rotated eventually rotates the rollers and the cutter. Thus firstly when you roll your dough in the roller it will give a thin slab of pasta dough. Later after doing it a couple of times and after acquiring the desired thickness you will pass it through the cutter. In the cutter, it cut the slab of pasta dough into various small and particularly sized strips of pasta in the way you required.Thus the rotation of the rollers and cutters will roll out the pasta in the shape as you wanted. You are even provided with the facility of adjusting the rollers. By adjusting the rollers with the adjusting knob you can achieve the required thickness of the pasta. These conventional pasta makers are typically used to make longer types of pasta. Spaghetti, fettuccine, pappardelle, angel hair and lasagna sheets are the longer types of portions of pasta that can be made with these conventional pasta makers. 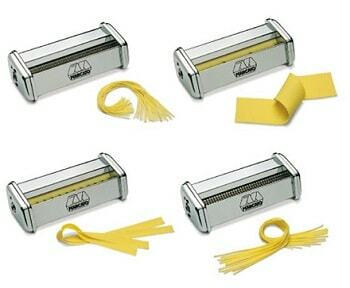 other various types of pasta such as ravioli pasta can be made by the attachments such as ravioli stamps and cutters. Marcato Atlas Wellness 150 and CucinaPro Imperia are currently the best pasta maker machines available in the market. Both of these pasta makers’ reviews from the consumers and the experts are unexceptionally good. These models are the best in their kind. These pasta makers have proved themselves to be the best over the years and they still are. The brand Marcato pasta makers and Cucina Pro pasta makers are world renowned as they have marked a standard in the market. Besides the fact, both these brands manufacture the high-quality pasta maker machines in Italy. Whereas as almost many of the pasta makers are made of low-grade materials and poor quality, they are mostly made in China. Other than the conventional, the classic pasta maker machines there even exist a modern type of pasta maker machine. The advancement in today’s world and the development in technology have made an ideal change in the pasta maker machines. the electrical pasta extruders are the new pasta maker machines in the sector of pasta machines. These highly efficient pasta making machines have a different working principle than that of the classic pasta maker. Aside from the classical pasta machine, there is also an updated more modern type of pasta machine. This modern machine works on the electric current supplied to it and are know as Electric pasta extruder. The electric pasta extruder does not roller or cutters to produce pasta. In fact, these pasta machines use shaping discs that will help to push ahead the dough of pasta. These pasta extruders are far more advanced and efficient than manual rollers because most of these machines will also make the dough for you in a different and special mixing compartment. You can even produce certain kinds of pasta that you can also produce with a classic pasta maker, for example, lasagna sheets and spaghetti, you can also produce round-shaped pasta for example penne pasta with a pasta maker machine. Ravioli can only be made if a stamp to make ravioli is available with you. Electric pasta machines are most bought by those who are planning to make or making pasta on a more regular basis. The comfort and ease of using these machines are very high. The pasta extruder is efficient and user-beneficial as you have a very less work to do. The more regularly you plan or make pasta, the more interesting you find an electric pasta maker, especially a pasta maker machine. Where lesser known brands are dominating the pasta industry for classic pasta maker machines, a well-known brand is already performing better when you look out for pasta extruders. Philips is the one doing the job very well for themselves and their customers by manufacturing the Philips Pasta Maker. The Philips Avance Collection Pasta Maker is a complete electric pasta machine which mixes all your pasta dough and then pushes the dough through the combing mechanism to produce a lot of different shapes of pasta. 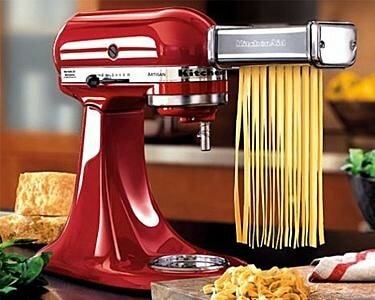 It instantly produces a large mass of pasta. This would be beneficial for you in a way that you can quickly move on and then can concentrate on other kitchen activities. What to look for in a pasta maker? Whether your need of buying a pasta maker machine is household, commercial, cooking for family or friends or of making different pasta recipes, your first concern regarding the pasta machine should be the kind of pasta you will make in the future. That means what different shapes of pasta you will be making from the machine should be determined initially. After choosing the shape of pasta, the next important thing is to decide how much manual effort you are willing to do for making pasta every time. So basically starting with these specifications and choosing the required category of pasta maker you later need to go through other specifications. When you select a pasta maker machine for your requirement the most important thing that runs the machine is the manual effort or the electric power supply. Hence to run the pasta machine, you either require to manually crank the dough by feeding the same to the machine or use an electric model of the pasta maker for the same work. If you are using a manually operated pasta machine you can have more control over the speed of making the pasta and in shaping the dough. But eventually, it requires more muscle power to do the work manually and may sometimes become tiresome. While with the electric pasta machine you generally do not require the muscle power. But in this, you often do not have the options to slow down the rolling process at a certain specific speed. Not all pasta maker machines have the facility of various accessories equipped with it. Mostly the kit that comes with the pasta maker machine may or may not have the requirements that you need. But actually plenty of accessories come along with the machine. But it is suggested that you should check the accessories which are in the kit while you purchase a pasta maker. Many of the electric models consist of almost all the features and even consists a mixer as well. This mixer helps you to feed the pasta dough through the rollers of the pasta machine. This extra featured electric pasta maker machine makes the pasta making process simpler and faster for the people who just have started making the pastas on their own or for those who do not have sufficient time to spend in making the dough manually. Thus a pasta machine provides you a much simpler way to those who produce a lot of pasta or for those who want to reject and say no to the unhealthy processed chemical foods that are available in the stores. Most of the pasta makers machines have the default adjustments made perfect to produce the standard plate of spaghetti. Whereas various other pasta having a circular shape or thin noodle shape like linguine and even the angel hair pasta can be made using the same model but may require different attachments to do so. Moreover, this pasta maker machines provide you the facility of making different shaped noodles such as lasagna, tagliatelle, fettuccine and the thicker pasta as well. So you need to choose the pasta maker machine and the attachments as per the requirements. If you only need to make one particular type of pasta, the machines with the more limited ranges of abilities suit your household. However, if you need to make many types, as in a commercial kitchen, one of the models with more shape options is a better fit. If you only need a specific type of pasta to be made then you should buy a pasta machine which can give you the desired shaped pasta. Hence a the pasta maker with a more limited range of abilities will prove to be a great help to you for the household purpose. And if you need various types of pasta to be made or if you require it for a commercial kitchen, the pasta maker machine with more shape options and specifications is a better option. Pasta making is an art and that art needs an expert to make it a masterpiece. Hence, KITCHENOPEDIA has provided you the reviews of BEST PASTA MAKER MACHINES so that you can also be a pasta artist. Frankly speaking, the KITCHEOPEDIA team has worked really hard to come out with this article after great efforts from our experts and has land you the information regarding the best pasta machines and other related topics. With the help of this article, it will be easy for you to choose a perfect pasta maker and its accessories according to the best suitable for you.